MULTIFUNCTIONAL – Blocks calls, SMS, Wi-Fi, 4G, Bluetooth, RFID, NFC – Blocks & Unblocks in just 5 seconds! Discourages phone use whilst driving – no notifications, no distractions! 1 x Car Key Signal Blocker Pouch. Right side and airbag direction. When lock is cut by thief, airbag apron will press the car horn to make. Three-direction lock design: the steering wheel locked at the left side. The angle of the lock apron can be adjusted so as to make it more. NEW FOR 2019 . Padlock not included. UNIVERSAL HEAVY DUTY PEDAL CLAMP LOCK. The pedal lock restricts the would be car thief from using the clutch and brake pedal as they would both be clamped together. The Stoplock Pro Elite provides the most universal fit compared to it’s sister models. Featuring a deeper bend in its structure & larger forks to wrap around a steering wheel allowing for a greater size tolerance. 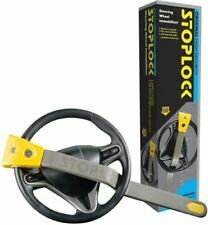 Car Twin Bar Double Claw Yellow Anti Theft Steering Wheel Lock. Rubber coated and twin bar lock. Thieves use a device which reads the vehicles electronic information off the key as the owner uses it, or they break into the vehicle and connect a device to the OBD port, downloading the vehicles information onto a blank key in a matter of seconds. Part Number - E12788. Ear-piercing 130 Decibel Siren. Personal Audible Alarm. Two Security Keys. High Impact ABS. The second and main slot (gold colour inner lining) holds your keyfob. There is also an inner keyring for your keyfob to connect to. RFID signal blocker lining. RFID signal blocking shielded key fob pouch. Car Tire Claw ATV RV Wheel Clamp Boat Truck Trailer Lock Anti Theft Parking Boot. Suitable Vehicle: Boat Trailers, Caravan, Trailers, SUV, etc. Lock Type: Wheel Lock. 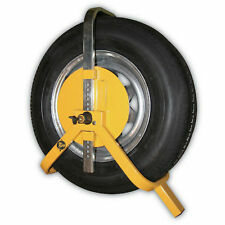 1 x Car Wheel Lock. Ideal for long stay car parks, car sales forecourts and trailers. HEAVY DUTY HANDBRAKE SECURITY CAR VAN LOCK GEAR SHIFT ANTI-THEFT 2 KEYS Roadster Branded, Brand New DESCRIPTION: Fits most Cars/Vans Simple and quick to lock and unlock Anti-theft grear shift and break lock Comes with 2 keys High quality durable & reliable. The KS1 by Disklabs is designed for security-conscious car owners, who want to ensure that their car keys are not scanned or cloned, or the keyless fob signal is amplified by theives looking to gain entry to their car. Car thefts up 56% since last year, Relocate your port! 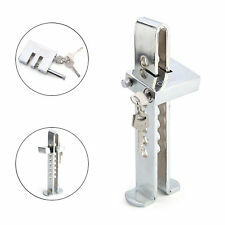 High Security T shape anti theft vehicle pedal lock. Lock/Clamp Type: Pedal Clamp. The lock works by restricting the break and clutch pedals. Fully adjustable, can be set to different heights. Includes two spare keys. It provides added visible security ideal for when the car is parked. This lock is very quick & easy to fit, on in seconds and if you have the keys just as easy to remove. Key design is almost impossible to duplicate. • Anti-theft grear shift and break lock. Here you?ll find the latest and greatest products. In other words ?. When you order from us, you?ll always get a great product at a great price. • Includes 2 keys. Replacement Locking Wheel Bolts High Quality 4 Bolts Supplied 1 Locking Key 12mm x 1.5mm Thread Length: 23mm Seat Type: 60° Taper Key Size: 17mm For use on Alloy or Steel wheels. PLEASE NOTE BEFORE ORDERING Please make sure BEFORE ordering that you lake a look at your original size and thread as manufactures has a tendency of changing specifications from time to time an can not be responsible if you order the wrong ones. PLEASE NOTE Important notice BEFORE ordering Please DO NOT rely on the compatibility list to make your decision of parts, as cars come with many variations and fitments on the same make and models. Check things like dimensions size and other stated fitment criteria prior to ordering to make sure you get the correct part as vehicle parts can have more.